Indianapolis residents and visitors enjoy fruit-tree bounties galore thanks to an agreeable growing climate. Warm summers and cold winters precipitated by Canadian fronts moving through from the northwest help create crisp apples, sweet pears and other delectable fruit. Farmers markets and backyards in and around the state capital are regularly filled to the brim with fruit at harvest time. Honeycrisp apples are valued for their ultra sweet flavor. The large yellow fruit is suitable for eating alone or baked in pies. According to Purdue University Cooperative Extension Service, they grow especially well in north central Indiana. Honeycrisp trees are susceptible to common apple-tree diseases, but those are more likely to appear in trees that grow further south. They grow up to 20 feet tall and are weaker growing than some other cultivars. They dislike growing in consistently hot weather, which Indianapolis does not always offer. Similar to Jonathans in taste and quality, prima apple trees thrive in central Indiana and are immune to scab disease. Fruit is bright red, medium to large in size and with yellow flesh that tastes tart. Harvesting takes place for early fall markets, although the fruit does not store for long. Trees, which grow up to 30 feet tall, are vigorous growers and prolific producers, growing fruit that is up to 80 percent of eatable quality. These are widely cultivated trees all over Indiana. They grow up to 20 feet tall and adapt well to varying weather conditions. 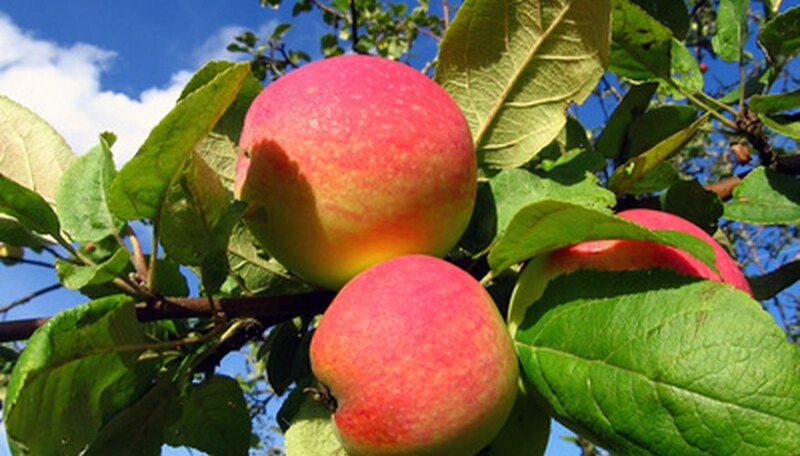 Fruit skin is yellow, with tender, light yellow flesh, and is suitable to use in many dishes, especially desserts. These apples cannot be stored long because their skin is not as waxy as other cultivars, and therefore does not retain moisture as well. Cherry trees, both sweet and tart, grow in a variety of well-drained soil types. Indianapolis is a good city to grow them in because cities in general do not get as cool as rural areas, thereby promoting better fruit production. Montmorency cherry trees, which produce large, tart cherries, grow well in the capital. Fruit is bright red with yellow flesh that is often used in pies and made into preserves. Trees require modest pruning and weed control around their bases. Standard varieties grow up to 18 feet tall. American Plum Trees, growing up to 20 feet tall, are very cold-hardy, making them suitable for growing in Indianapolis and elsewhere in the state. Fruit is sweet when ripe, and makes good jam because of its pectin and acid content. Plums are initially light green, turning red or yellow as they ripen. The flesh is a golden color. Trees grow in a wide variety of soil types that are moist and drain well. White flowers bloom in early spring.